Mobile accessibility is all the rage in the modern world of printers. Whether categorised in the enterprise class or consumer level, every printer these days is designed to provide users with mobile connectivity. For those of you who don’t understand what this feature means, it allows a user to print things from his or her mobile device. Businesses that are based on Bring Your Own Device (BYOD) infrastructures or individuals that use mobile devices particularly need mobile connectivity with their printers and Multifunction Printers (MFPs). To cater to this specific requirement of Kyocera printer and MFP users, Kyocera Document Solutions Inc. has released a new business application called the Kyocera MyPanel. While not as advanced as many other such apps provided by other Original Equipment Manufacturers (OEMs), the Kyocera MyPanel does allow simple operations that have the potential to improve the efficiency and productivity of many businesses. The Kyocera MyPanel app can not only be used for the above mentioned simple functions but for also monitoring the device. 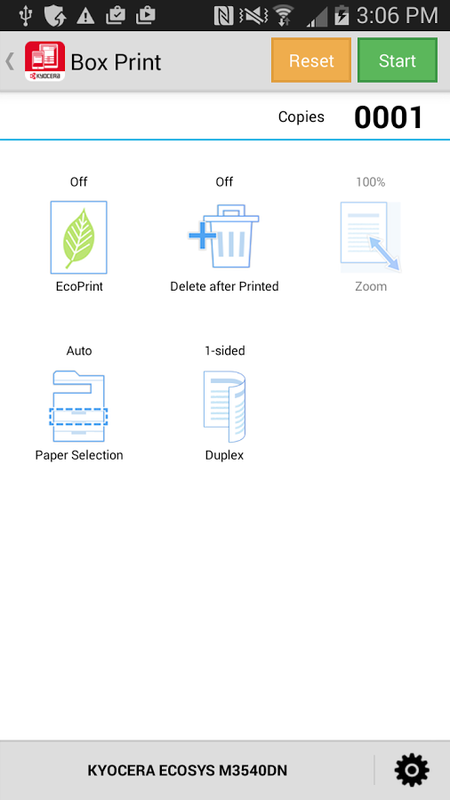 For example, the app can be used to monitor the state of consumables in the printer as well as paper size. These features allow the Kyocera MyPanel app to improve the efficiency and productivity by providing added convenience and simplifying document workflows in the office setup. For instance, the Kyocera MyPanel app can be used for copying, scanning, and printing from a custom box. However, the real benefit of this business app by Kyocera is that it can substitute display panels on Kyocera printers and MFPs. What this means that any Kyocera printer or MFP user can use this business app over and above the panel installed in the machine. The app also boasts of integration with cloud technologies such as OneDrive, DropBox, and Evernote. This means that users can use the Kyocera MyPanel app to connect to these cloud services and print documents stored therein. Additionally, the Kyocera MyPanel app also allows users to set their unique preferences. User preferences then carry over from one printer model to another. The Kyocera MyPanel app is versatile as it can be used on Windows, Android, and iOS platforms, which means that it can be downloaded from their respective app stores. A while back, we covered the common printer security risks that printer users need to be aware of. The reason for that post was that printer security threats are becoming increasingly diverse and varied in conjunction with instances of identity and document thefts. While individual printer owners are at risk, the real risk lies at the enterprise level. As a result, we followed that post on printer security risks with one on printer security tips containing advice on how to protect organisation wide networks. We aren’t the only ones in the world of printing that are focusing on printer security. Even the OEMs have been going out of their way to protect their machines from external dangers. The latest to have made moves in this direction is HP with its new enterprise class printer models that the company is boasting are the most secure printers in the world. The new printers are a part of HP’s LaserJet series and carry some very impressive security countermeasures that should have businesses clamouring to acquire them. These machines not only have heightened protection down to the BIOS level but they also have exceptional self – healing capabilities. There are three new printer models that boast of this new form of security. These models are the HP LaserJet Enterprise M506dn, the HP LaserJet Enterprise MFP M527dn, and the HP Color LaserJet Enterprise MFP M577dn. Each of these models is capable of churning out anything between 2,000 and 7,500 pages every month. While the printer models released by HP carry all the bells and whistles of the modern day enterprise level machines, their highlight is indeed their increased security. The security measures in the new HP printer models are based on three elements. The first is the HP SureStart feature. The HP SureStart feature means that the BIOS code of the printer is validated regularly. When any kind of discrepancy is spotted by this feature, it goes on to reboot the printer with a special “golden copy” of the BIOS being deployed, effectively eliminating the offending code. The second is the Whitelisting feature. The Whitelisting feature is designed to verify the firmware installed on the printer in question. What this feature does is that it verifies the firmware installed on the printer to be “digitally signed” by HP so that unverified latched on elements are countered. The third is the Run – Time Intrusion Detection feature. The Run – Time Intrusion Detection feature’s job is to monitor and protect the printer during its operation. This feature monitors the firmware and memory related operations of the printer to pinpoint anomalies of any kind. If an anomaly is detected, the printer is rebooted to cut off the access. Anomalous operations in firmware or memory functions are usually a sign of security breach. These features combine to give these new printers their self – healing capabilities and make them one of the most well protected printing machines in the market currently. The technical details of these features can be found here. The release of these new, highly secured printer models is supposedly a part of HP’s overarching strategy for giving the market with machines boasting of the deepest security possible. Along with the launch, HP cited some very interesting facts pertaining to printer security. One of these was that about 64 percent of IT managers consider their printers to be infected with malware, sourced from Ponemon Institute. Another was that about 56 percent of enterprise level companies fail to incorporate their printers into their “endpoint security strategy”. The new security features are supposed to help enterprise level organisations bridge this gap. Along with these inbuilt security measures, HP has also released its JetAdvantage Security Manager. The JetAdvantage Security Manager is the industry’s “only policy based security compliance solution”. It performs dual functions with the first of them being automatically checking and resetting device security settings that show deviation so that the printer continues to comply with the organisation’s overall security policies. The other function of the JetAdvantage Security Manager is to give IT managers capabilities such as closing access ports, erasing sensitive files, and disabling access protocols as and when required.